Hey, another gig that hasn't happened yet. 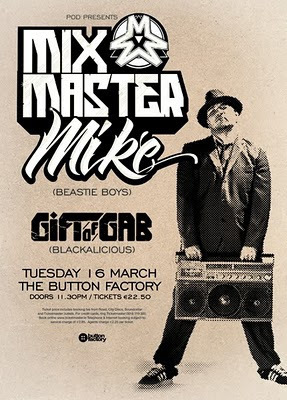 This is for one next week when Mixmaster Mike comes to town. This is another one that started of as a very last minute design for a larger print ad then just carried on being the design for the gig. Not the best way to work it but I don't like it when the one gig has a couple of different designs and once something is used I tend to try and stick with it. I like consistency.